The stunning Perenthian islands are located 12 miles off the northeast coast of Peninsular Malaysia in Terengganu state. 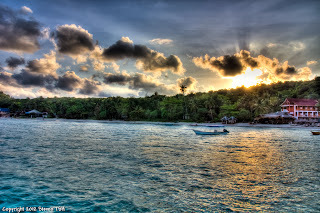 The two main islands Perhentian Besar (Big Perhentian) and Perhentian Kecil (Small Perhentian) form a part of the Redang Marine Park area and provide a protected environment where fishing and collecting of coral, is prohibited. Popular with backpacking tourists, the islands offer soft white sand beaches encircled by cerulean waters and pristine coral formations. 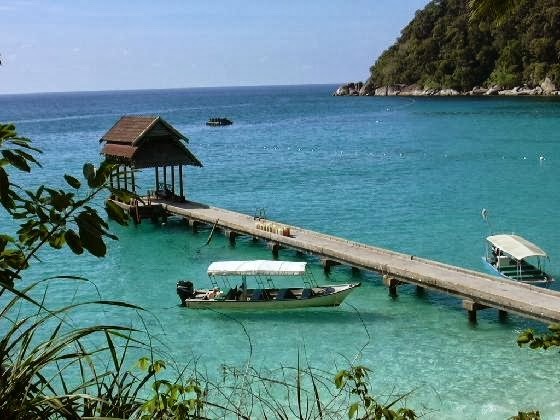 The islands host several excellent dive and snorkeling sites and can be accessed via a frequent ferry service from the Kuala Besut jetty situated in a small fishing village in Terengganu. 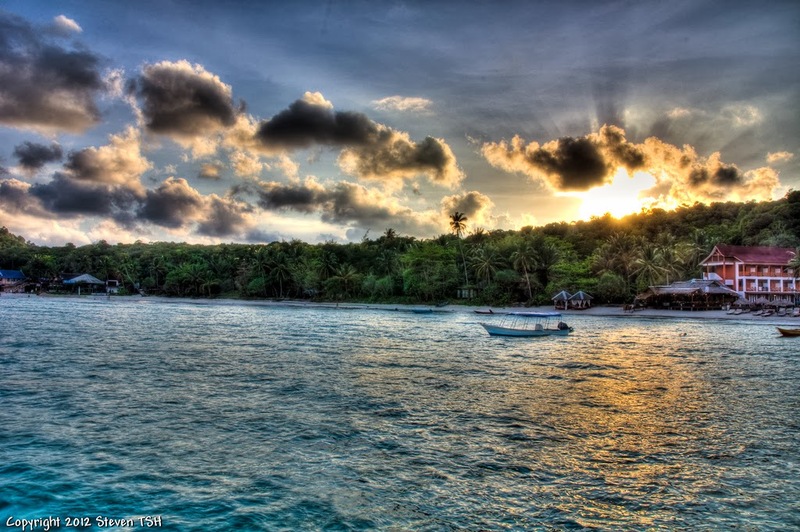 The Perhentian islands are closed during the monsoon months of November to February. Additionally, no vehicular traffic is allowed on the islands, which are car free. Both islands feature a landscape composed of white sand beaches surrounded by lush jungle terrain. The Big Island is home to upscale resorts while the Small Island features cheap backpacker accommodation along beaches like Long beach and Coral Beach. Dive schools, bars, clubs and restaurants abound on both these beaches. Both the islands are equipped with small restaurants that serve wholesome local and international meals at fairly reasonable prices. Additionally these dining spots also host raucous fire parties in the evenings and provide much nocturnal entertainment for tourists. Most of the dive shops on the beaches of the Perenthian islands offer both SDI and PADI certified courses at reasonable prices, so if you have always wanted to learn to scuba dive, the Perenthian islands provide a perfect opportunity to do so. The crystalline waters around the islands are littered with fascinating sea creatures like sea turtle, reef-fish, small sharks and more. If you don’t want to scuba dive, you can always choose to snorkel and the islands are littered with great snorkeling sites where you are guaranteed to see gorgeous, multihued coral, sharks and more. Popular snorkeling spots on Besar include Teluk Puah, Shark Point and Tanjung Basi. The best spot for turtle spotting is in front of the Perhentian Island Resort for the sandy bottom here is covered with algae and attracts turtles. The islands are crisscrossed by various jungle trails, which are fun to explore as they offer the chance to spot native fauna like monitor lizards, giant spiders and even monkeys. However do plan on bringing adequate bug spray and water for these treks can be quite ardorous. The Malay word Perenthian translates as ‘stopping point’ and visitors essentially come to these islands to kick back and relax. The white sand beaches of the islands like Long Beach and Coral Bay are thus suitably equipped with hammocks and the like for such activity. Coral Bay is known for its stunning sunsets and is a popular look out point with enthusiastic sightseers. The waters around the islands are ideal for sea kayaking and many resorts on the islands rent out equipment if you want to take a kayak out to sea. The resorts also offer organized tours for those tourists who would rather not venture out on their own. Sea Kayaking presents a great way to tour regions of the islands not really accessible on foot. The Perenthian islands provide the perfect opportunity to wind down and if you are feeling especially stressed and run down, then why not plan a trip to these islands to savor their stunning natural beauty? The best time to visit the Perenthian islands is from March until the end of October. 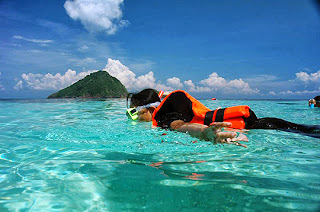 The waters around the islands are generally clearer around mid-April when the sea has settled after the monsoon season, which typically lasts from November to February.